This morning I joined my second tour, the 14 day Gorillas & Game Parks Safari. We have an even bigger group of 28 travellers (plus our tour guide, driver & cook) but 6 of us were on the previous 3 day trip together which is cool. We found out they've changed our itinerary somewhat because there are 2 trucks doing the trip at the same time. So we've swapped our Masai Mara visit to the end and instead headed to Lake Nakuru National Park today. Suits me since I just couldn't face the drive straight back to the Masai Mara again today! 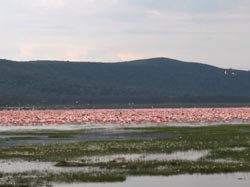 Lake Nakuru provided the most spectacular volume of flamingos I've ever seen. It made for a beautiful view - blue sky, a stripe of pink flamingos and then the green grass. Unusual.